No matter their complexity, we can build custom wire harnesses from all industrial UL wire types and connectors of different sizes and types. Read more. 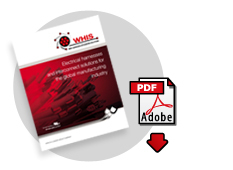 WHIS can provide nearly any custom configured cable assembly or interconnect product. Read more. Our capabilities include the design and manufacture of an enclosure to your exact specifications. Read more. We manufacture built-to-order power cords and assemblies to OEM's, contract manufacturers and other high-volume users. Read more. Our design and engineering experts bring value to the product development process, working virtually every stage of the design cycle. Read more.